The U1270 series of hand held digital multimeters is now available from Agilent Technologies , offering high performance measurement capabilities in a compact yet robust unit. 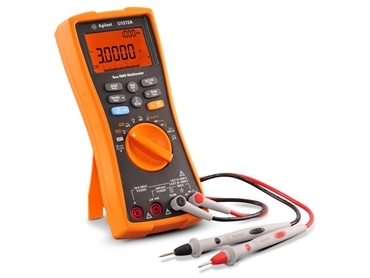 Fast and accurate, these hand held multimeters feature capabilities such as a low impedance mode to eliminate stray voltages, and low pass filtering for the removal of noise that distorts voltage and current readings. In addition, a new Smart Ohm function reduces the incidence of false readings due to current leakage. Capable of PC connectivity for data logging applications, these hand held digital multimeters have been designed with a flashing backlight that works as a visual alert to enhance continuity checks when used in dark, noisy environments. They have a slim, easy to grip profile and controls, ensuring they are easy to operate even when wearing heavy gloves, with easy access to the fuse through a rear panel battery door for quick maintenance. IP 54 certified to ensure dust and water proof characteristics, these units add to the range available from Agilent that is CAT III 1000V and CAT IV 600V compliant.